October and November are providing a glut of tournament series easily reachable for Oregon players, even with the maddening cancellation of Grand Sierra’s Pot of Gold series last month. The geniuses at the WSOP managed to schedule the only two Circuit events west of the Rockies and north of Las Vegas for practically the same dates, with twelve-day events in Lake Tahoe and Vancouver overlapping by eight days. They’re quickly followed by the Thunder Valley (outside Sacramento) NorCal Classic and the Fall Poker Round-Up at Wildhorse in Pendleton, which both start on the same day and run for twelve and eleven days, respectively. The new Poker Night in America opens at Reno’s Peppermill in the middle of both those series,and Lucky Chances in the Bay Area starts their Gold Rush as Wildhorse and Thunder Valley wind down. There are big dead zones in the Northwest poker schedule—like, most of the rest of the year—why there’s a rush to cram everything in between Halloween and Thanksgiving, I cannot fathom. Those are just the big ones. Spirit Mountain Casino ran their anniversary series in mid-October, a week before the Lake Tahoe Circuit event, and Portland’s Encore Club put on four events culminating in a $50K guarantee tournament the week Tahoe started. Then, of course, right into the middle of the WSOP Circuit tangle-footing, the DeepStacks Poker Tour decided they had to return to Lincoln City on the Oregon Coast. 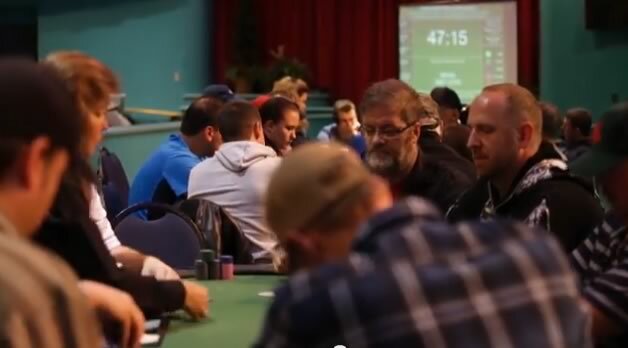 They had some success with the PacWest Poker Classic in February, but you have to wonder if a smaller event in an out-of-the-way (if sometimes quite pretty) venue was a great choice when up against two big, established events just 700 miles apart. Much of the week of the OSPC, the weather at the beach was exceptionally pleasant, with unseasonably warm (and dry) weather for late October in Oregon. I traveled down on Wednesday to play in the bounty tournament, dragging along DL, who was hoping to get some cash game action. The cash games didn’t get going for several hours, and I busted from the tournament after a little more than five hours. Rather than stay late and play the smaller bounty game at 7pm, we took advantage of the light to make the two-and-a-half hour drive back to Portland. Saturday morning, I headed back down to play the $1,100 Main Event. The February Main Event had 165 entries, and they were guaranteeing $150K for the OSPC. I hadn’t ever cashed in an event with a buyin of over $1,000 (not that I’d played many), but this would likely be the first time I’d played one with a smaller field, as opposed to something at the WSOP or Venetian. My in-the-money record for the year in tournaments between 28 and 200 players with $100+ buyins (usually an indication of a slower structure) is 22% (11 out of 51), with four wins/chops, although my only cash with more than 100 players was 7th of 101. So I thought I’d take a shot at a pot with a possible overlay (and an estimated $40,000 payoff for first). Day 1A ran on Friday, getting only 55 players and playing down to 22 over the course of twelve hours (ten hours of play). Day 1B started slow, but eventually picked up 102 players (including re-entries) to bring the total entrants to 157. I got off to a great start (starting with 25,000), with A♥5♥, making the nut flush over a guy with second nut flush and pulling over 30,000. Then I lost it when my top two pairs were outdrawn because I didn’t shut things down fast enough (a bit more difficult to do when you’re 250BB deep). Tossed 2♣4♣ twice in a row, which would have flopped a winning straight on the first hand and winning trips on the second (damn you, Poker Grump!) Then 7♥9♥ flopped top pair with an open-ended straight flush draw and won with a straight, putting me up to 38,000 by the end of the third level. Another straight flush draw cost me, though when I once again failed to shut things down after hitting a nine-high flush on the turn and a jack (instead of a ten or five) completed a better flush for the player holding the king. That started a period of below-starting stack play. After four hours, I was down to 15,000 chips, which was only 60% of starting, but still a workable 75BB. Five hours in, I shoved all in for the first time over a raise, holding AxKx and took the pot, moving me back into starting stack territory. Up to 30,000, back down to 20,000, then stabilized at 25,650 for the dinner break. Back-to-back 8x8x hands—including one that made a full house—put me over 35,000 finally. Then three QxQx hands in the first hour after dinner flopped two sets and allowed me to bet enough to get folds the third time. Nine hours after we started, I was up to 53,000 after I peeled 10,000 of a player who called with AxTx and top pair against my KxQx and trip queens. 70,000 chips by 10pm. A tight but incorrect fold cost me 10K, but I gained a little bit before the end of play for the night and bagged up 63,700, a bit over the average stack and . My first-ever bagging (out of 14 multi-day events played over the past 30 months). The first three hours of Day 2 were a grind. 69 players were returning (I was in 26th position), with 51 eliminations to go before the money. I was losing ground and the stacks were getting bigger. My turnaround hand got reported on because it was against one of the Team DeepStacks players. That doesn’t record the pre-flop action, which—if I remember correctly—was a raise and two calls. There was apparently some consternation over my play, but that seems to me as if it’s a fairly decent semi-bluff. If Wade has kings or queens there, he’s actually in worse shape than he was with jacks, because all four of the cards that complete the upper end of my straight draw would have been live. Ditto for AxKx or AxQx. Those are all in the “coin flip” range: 45%/55%. Even with a set his best odds are 3:1. Which means he loses 25% of the time. If he knows what I have, then, sure, he knows he’s ahead, but if I called with a suited JxTx, he’s a 1:11 dog. He’s behind 3:1 if I have a set. But he called for more than half his stack with just the over pair and an inside straight draw. I don’t know if that’s any better play than my shove. Five hours into day 2 and we were down to three tables. I was on the button when Nguyen shoved for about 20,000 and it was a relatively easy call. I spent most of the afternoon seated next to Toma Barber, who was severely short-stacked after a rough early session. He didn’t lose his calm, though, and looked for an opportunity. A good one never seemed to come, and eventually as the blinds got to him he was in for about half his stack just for the big blind and ante. The player on the button (I believe it was Micah Bell) raised enough to put Barber all in, the small blind called, and Barber dropped the rest of his stack in. Then he won the pot and more than tripled up, beginning a great comeback that eventually ended with him on the final table taking sixth place. We were on the bubble with 19 players as we went to dinner that evening. I sat with Mike Zuco and his wife, and Toma, who knew each other from the Encore Club. The buffet provided for the players was remarkably good. We got back into play at the 2,500/5,000/500 level. I had just over 20BB. Then the money bubble broke and I caught a few hands, putting me up to 160,000, which was still well under the chip average. We’d redrawn seats for the final two tables (I never did make it to the live-streaming feature table, although my friend SM spent some time up there on Day 2) and the secondary table I was at had several shorter stacks on my end and a Murder’s Row of large stacks in a row on the other. While queens had done me well after dinner on Day 1B, they proved to be my downfall on Day 2. I picked up a pair UTG and opened with a 4x raise to 20,000. There was one caller from the big stacks and we saw a flop of 9x7x4x heads-up. I c-bet 35,000 (with about 100,000 behind) and he called. Over 100,000 in the pot at this point. The turn was 9x and I did the wrong thing and shoved. He called and flipped over 7x7x. There was still a faint hope of a nine or a queen hitting the river but instead I got a 6x and made the short walk to the payout table to collect my min-cash for 16th place. Not the way I wanted to go out. On the plus side, I got to the second day of a multi-day event for the first time and I cashed in a tournament with a buy-in of $1,000 or more for the first time. On the minus, I played for nearly 20 hours for a profit I could easily outstrip back home in Portland in nine or ten hours, with a much smaller initial outlay. The DeepStacks Main Event structure was quite enjoyable to play. Hour-long levels and a slow, steady progression of the blinds really put an emphasis on gameplay. Where I thought the event could use some improvement was on some technical/physical issues. The bounty tournament started rather late (though not nearly as late as the 2012 WSOP Doubles tournament) because they were assigning seats incredibly slowly. For me, the worst part was through much of the afternoon of Day 2 when I was seated with my back to the stage. The proscenium lights facing toward the auditorium above the stage were on—they weren’t needed for the live-stream table on the stage because they weren’t even pointing at the stage—but in the first row of tables the shadows they created (out of my own body!) cast a penumbra across my cards, making it incredibly difficult to simultaneously see my cards and keep them protected from the players on either side. If they were right in front of me, it was like looking into a cave when I tilted the corners of the cards up; if I moved them far enough to the side to get into the light, I was practically in the space of the next player. DeepStacks needs to do more to keep the players up-to-date on information, as well, starting with not deleting information off their web site. Links to updates on the February PacWest Classic are dead all over deepstacks.com, so it was incredibly difficult to find out information on the previous main Event, and impossible to track down field and prize information on the rest of the series. In a bounty tournament, it’s really useful to have updated counts of the remaining players (i.e. number of bounties remaining). For a small event with an $1,100 buy-in, the remaining player count should be spot on throughout the tournament, not just in the last stages; it’s not a WSOP event with thousands of entries. If my local poker room can keep the count up-to-date for a 160-entry $40 tournament, I ought to know the number when I’ve ponied up more than twenty-five times that. And please, split the live video feed off the text updates. It takes forever to load on mobile devices now, and with the “no mobile use” at the table rule at Chinook (and elsewhere) you can’t get updates on what’s going on in the rest of the tournament. People reading the feed in Australia are better informed than the players in the tournament! Still, I’m glad I played it. If I get the chance, I’ll be pitching myself into the Wildhorse Fall Poker Round-Up High Roller event next week in Pendleton, which has a very similar structure. Otherwise it’s HORSE on Wednesday! Sixteen-and-a-half hours. 16th of 159 entries. +84% profit.